We serve patients with comprehensive treatment plans using the latest dental technology and innovative equipment. Dr. Ryan Horn, Dr. Barron Hong, Dr. Meetu Moody and Dr. Anand Maharathi are proud to serve patients with some of the latest technologies and digital equipment used in the industry. From performing computer guided dental implant surgery to soft tissue procedures with the diode laser, our board certified doctors make use of state-of-the-art equipment to ensure optimal results. This allows us to deliver the very best treatment to all of our patients. We perform a number of non-surgical procedures using the diode laser. 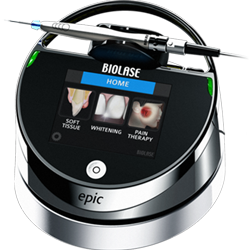 Laser therapy allows us to perform gingival gum contouring, biopsies and other procedures without scalpels and stitches. Our office is equipped with a state-of-the-art cone-beam CT (computed tomography) device that produces highly accurate 3-D radiographic images of the mouth and jaw. These images are a vital part of the diagnosis, planning and treatment process. We can produce fast radiographs during a surgical procedure. These images also make it easier to take measurements with a high degree of accuracy. Digital radiographs emit less radiation than traditional x-rays. 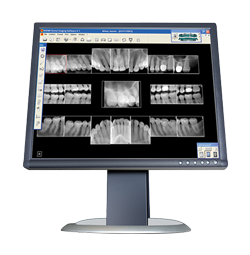 We make use of 3-D radiographs and specialized computer software programs for implant planning. The 3-D scan is very precise and allows us to virtually place implants in areas with adequate bone volume. This type of dental technology helps us maintain a high success rate with advanced dentistry procedures like dental implants. 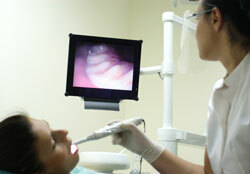 Using an intraoral camera allows us to perform a very fast and accurate diagnosis. This camera produces real-time images of the mouth during your exam and gives us a chance to show you exactly what the state of your oral health looks like. We use digital x-rays to capture high-quality images before and after treatment. These are stored in your patient files and are a convenient alternative to traditional x-rays.